This is a TOTALLY unique piece of silver leaf jewellery. 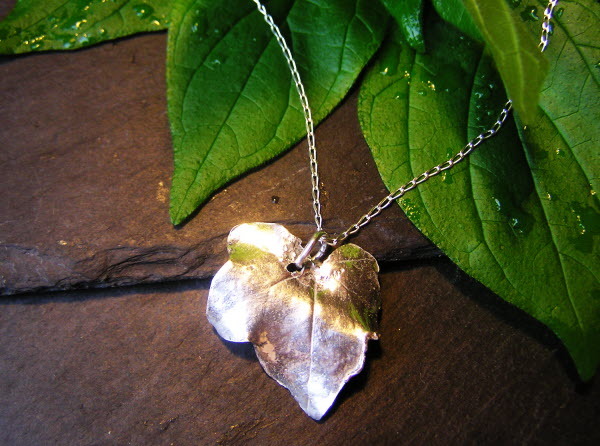 Rather than just being a mold or cast - reproduced OVER AND OVER AGAIN, this necklace is intricately made from a real leaf. I chose a nicely shaped leaf from my own garden, and with a complex process that takes nearly 2 weeks I have coated the leaf in 10 coats of a special silver clay called PMC. This magical substance starts life as a boring grey sludge, but when dried and fired for 2 hours transforms into PURE SILVER! Each leaf has to be meticulously coated over and over again and allowed to dry out between each coat. This takes roughly 2 days. It is then fired for 2 hours at 850 degrees celsius and this time in the kiln transforms it into PURE SILVER! The silver leaf then undergoes a lengthy polishing and finishing process that takes more than a week - which leaves a truly stunning and TOTALLY unique silver leaf. The leaf is then carefully drilled and strung with a sterling silver ring and then hung from an 18 inch sterling silver chain. The necklace is beautifully boxed in a padded black velvet lined jewellery box - and will even be nicely gift wrapped in tissue paper.